Bright beaks get the bird? Recently a regular visitor to Arran shared a digital photograph with me showing a male Blackbird with an orange/red beak rather than a yellow beak. What could be the significance of beak colour? This question led me to a study that was done on Blackbirds by French researchers under the direction of Frank Cézilly, Professor at Bourgogne University, Dijon. The research group has shown how male birds with very red or orange beaks are the ones that take in very high levels of nutrients, called carotenoids. Carotenoids are more than just colourful pigments - they are used in the body to neutralise harmful free radicals and to stimulate the immune system. 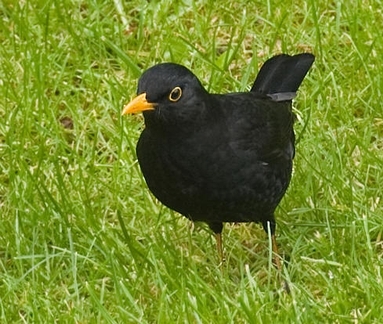 In their research, when they taxed the Blackbird immune systems - by injecting sheep blood into the birds - their beak colour became less red due to the decreasing amount of carotenoid in the beak. Their report said "In Blackbirds, dynamic reallocations of carotenoids from the beak to the immune system appear to convey a continual update on male health. Reallocations of carotenoids were observed in three weeks' time. We didn't think the response would be so quick." "Our research suggests that only those males with fewest parasites and diseases are likely to be able to devote sufficient carotenoids to their appearance to produce the best sexual display. While carotenoid-based beak colour is probably not the only factor these birds consider when selecting a mate, it is now clear that carotenoid levels are linked to sexual attractiveness and immune function," said Professor Cézilly, Professor. Such birds would have an advantage in the evolutionary "marketplace". Animals with stronger immune systems would naturally be better able to fight off disease. They may have more efficient physiologies, may be better at finding nutritious foods, or both. Their conclusion was that female birds find males with the brightest beaks the most attractive for good reason: these are also the healthiest birds.